Given contemporary sensibilities, he might have first made the scene today as “Plus-Sized” Domino. But Antoine “Fats” Domino, Jr. embraced his nickname from the start and has never tried to shed it with any Weight Watchers commercials. What you see is what he’s got. 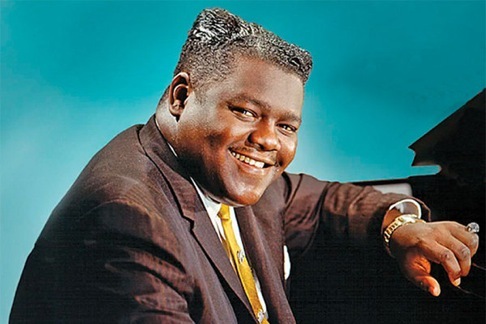 And the chart-topping, New Orleans-born, boogie-woogie heavyweight deservedly gets PBS’ American Masters treatment in Fats Domino and the Birth of Rock ’n’ Roll. It premieres on Friday, Feb. 26th at 9 p.m. (central), a date that coincides with Domino’s 88th birthday. His halcyon years were the 1950s, a decade he began by selling one million copies of “The Fat Man,” a variation of Champion Jack Dupree’s “Junker’s Blues.” Domino’s label was Imperial Records. Together they prospered with 37 top 40 singles, including “Ain’t That A Shame” (almost immediately homogenized by Pat Boone), “I’m Walkin’, I’m In Love Again, Walkin’ to New Orleans,” and his signature “Blueberry Hill,” earlier recorded with little impact by both Gene Autry and Louis Armstrong. “The year 1956 belonged to Fats Domino,” says narrator Clarke Peters. Riding a hot streak of sold-out tours and TV appearances, Domino’s chart-topping years pretty much went down for the count in the 1960s, when a “British Invasion” led by The Beatles and The Rolling Stones overwhelmed many an American rocker. But The Beatles loved him, and the film includes a black-and-white picture of John, Paul, George and Ringo looking very happy to have Fats in their presence. The hit TV variety shows of that era, all hosted by white men, also wanted a piece of Fats. He performed for Steve Allen, Perry Como and Ed Sullivan among others, with the latter ridiculously putting Fats’ band behind a curtain in the interest of showcasing him alone at his piano on the night of Nov. 18, 1956. Bandleader/trumpet player Dave Bartholomew, instrumental in producing and co-writing many of Domino’s hits, is described at one point as “the boss with the hot sauce.” Bartholomew and saxophonist Herb Hardesty led a horn section that helped to cook Domino’s hits to perfection. One of the delights of this film is seeing and hearing them in their full-blown glory. The producers also are smart to let “Blueberry Hill” play in full, with Fats in his prime wailing at the piano while sweating profusely. Fats Domino still resides in New Orleans after some believed him to be dead when Hurricane Katrina flooded his beloved Lower Ninth Ward in 2005. But although he doesn’t perform in public anymore, he still gets out and about from time to time. His last top 100 single was a 1968 cover of The Beatles’ “Lady Madonna,” which Paul McCartney wrote in appreciation of Domino’s style. The Domino effect can be felt anew in this lively, evocative hour. It goes by too soon, as did his days as a hit-making machine. But he never liked touring all that much, preferring to be back in New Orleans with his wife, Rosemary, who died in 2008. They were married for more than 50 years and had eight children, none of whom are interviewed in this film. Fats didn’t much like to be interviewed either after the spotlight dimmed. He preferred the comforts of home after making his fortune in times when he helped to build the very foundation of rock ’n’ roll with Elvis Presley, Chuck Berry, Jerry Lee Lewis and Little Richard. Only “The King” has gone down for the count. If only someone could get the surviving quartet back together again.